First Line: If I'd ever had reason to consider the notion, I'd have been willing to bet that if I walked into a room that held a dead body, the body would have been the first thing I noticed. Georgia Thackery has always looked like the black sheep of the family in comparison to her perfect sister, Deborah. An unwed mother and perennially untenured college professor, Georgia and her teenage daughter Madison have never been able to stay in any one place for very long; but a job offer at a local university means the two are moving into Georgia's parents' home while they are on sabbatical. Moving into her parents' home seems like some sort of defeat, and it also adds further complications to Georgia's life. Now she must try to keep Madison from finding out that the Thackery family home has its very own skeleton. Oh no, not the looming threat of previous ancestors' past misdeeds; it's not that at all. For as long as Georgia can remember, Sid the skeleton has lived in the house. Sid is real: he walks, he talks, he tries to keep Georgia's dog from burying parts of him in the backyard, and he wants to find out how he died-- and he insists that Georgia helps him. What Sid doesn't realize is that he may be putting Georgia in danger. 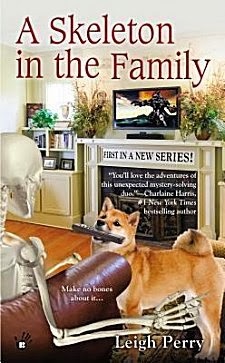 I'm open to new premises in the paranormal mystery category, so I was more than willing to give Leigh Perry's first book in this series about college professor Georgia Thackery and her family skeleton a try. From the very first page, I immediately began to enjoy Perry's writing style and sense of humor. Georgia Thackery is the type of funny, smart, and caring character to whom I can warm up quickly. One of the things I also appreciated was the wealth of knowledge this character imparted about being an untenured college professor-- it's not the sort of career any teacher would choose for themselves, and I'm hoping that Georgia can change that part of her life quickly. What I really need to talk about a bit is the elephant in the room: Sid the skeleton. How well did a talking, walking, joke-cracking skeleton (who has his own armoire in which to hide in case he's caught downstairs) really work in this book? For me, Sid was only an intermittent success. His dialogue and relationship with Georgia worked very well. These two have known each other for a long time, and it shows. Georgia genuinely wants to help Sid find out what happened. But whenever my mind's eye was drawn by choice of verbs and adverbs to the fact that there were fleshless footbones clacking across that hardwood floor, my inner movie screen jumped into a melange of 1930s black-and-white films with their herky-jerky special effects. Most fans of paranormal cozy mysteries will probably take to Sid like he's a long-lost cousin, and there's a lot to like about him and this book. I enjoyed the author's writing style and sense of humor, as well as the mystery itself and the character of Georgia. Unfortunately, were I to stop by the Thackery home, I'd prefer that Sid stay in his armoire. Cathy - I must admit - not my kind of book. It takes a lot for me to enjoy a novel with any element of the paranormal. But that aside, I agree; Sid just isn't my type. I like the author's writing style so much that I'm going to check to see if other books/series are out there.